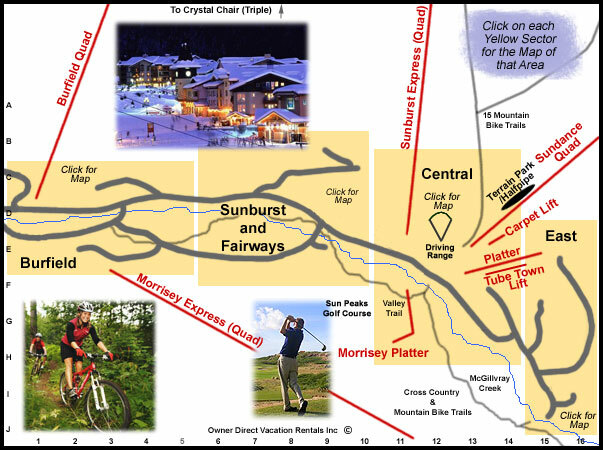 Sun Peaks Overview Map | Owner Direct Vacation Rentals Inc.
Sun Peaks is actually 3 mountains of fun and adventure offering all-season activity. From skiing and snowboarding in the winter to hiking, mountain biking and golfing during the warmer months. Sun Peaks features 122 trails of varying degree of difficulty with over 30% advance to expert. At the base of the mountain is a quaint European-style village offering a variety of restaurants, shops and other entertainment.